Always really pleased to see individuals leading the light rock fishing revolution and raising the profile of our sport. 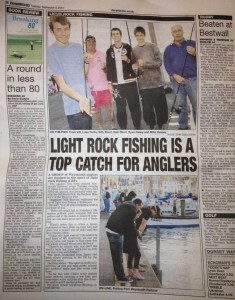 Hats off to Will Harding and the Weymouth LRF massive for getting light rock fishing into the Dorset Echo newspaper - in print and online! After a number of events and meetings recently, it looks like Weymouth is set up as the hub for Dorset LRF - they've got some great venues too. Hopefully I can get down and fish one of the weekly meets one time.